Thinning hair is a problem that many men and women face as they age. While there is not much that can be done to prevent hair from thinning or falling out, there are many treatments that patients can undergo to restore volume to the hair line. Hair transplants are probably the most well-known solution for hair loss. While hair transplant surgery offers remarkable results, some patients seek less invasive treatment options. 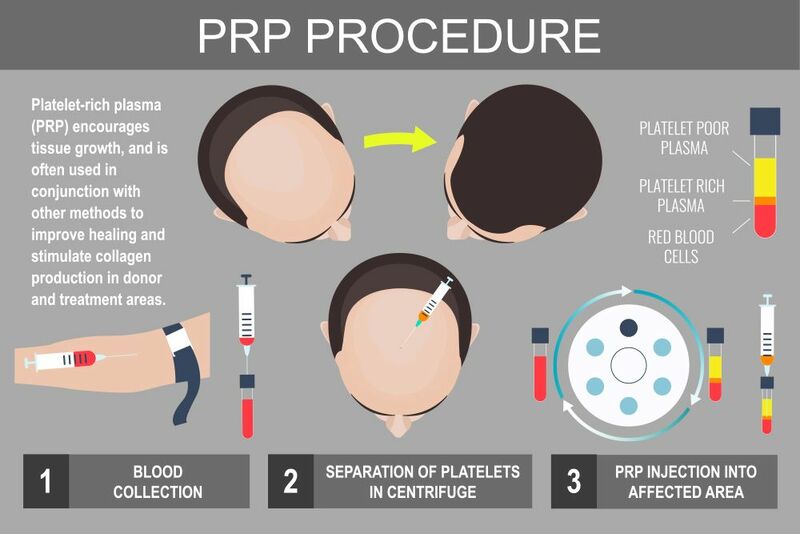 PRP hair treatment relies on platelet-rich plasma to promote hair re-growth. This non-surgical procedure is a newer technique, but it offers promising results to those patients who are ideal candidates. Here, patients can learn more about hair transplants vs. PRP treatment at our New York, NY clinic, True & Dorin Medical Group. Hair transplant surgery is a procedure that allows our doctors to implant donor hair follicles into a site that has experienced significant thinning or hair loss. Using either the strip technique or the follicular unit extraction method, hair follicles are collected from a site on the scalp that is still experiencing healthy hair growth. These follicles are carefully implanted around the scalp to fill in a thinning or receding hair line. It can take six to nine months for full hair transplant results to take effect, but once transplanted follicles take root, they will restore thickness and volume to give patients a naturally full head of hair. PRP, or platelet-rich plasma therapy, is a newer technique in the field of hair loss treatment. Previously, platelet-rich plasma has proven effective in stimulating tissue growth and increasing healing time for patients suffering from a wound or injury. Now, PRP is being used to stimulate dormant hair cells so that they spur re-growth. PRP is non-surgical, which makes it a great option for patients who are hesitant to undergo hair transplant surgery or are poor candidates for hair transplant surgery. During a PRP treatment, our doctors collect a sample of the patient’s blood. Using a centrifuge, we then separate platelets from the blood sample. Collected platelets are mixed in with extracted plasma to create platelet-rich plasma. After creating the PRP, we numb the patient’s scalp and stimulate it with micro-needling along the treatment site. If you are experiencing thinning or hair loss, the doctors at True & Dorin Medical Group can help you restore a full, healthy head of hair. To learn more about our hair loss treatments, contact us at your earliest convenience. You can schedule a personal consultation by calling (866) 629-0866.